There are many dry cleaners in the world today, and a fair few of them are actually very good. However, there are no other dry cleaners quite like us, and we take complete pride in that. We have been in business, as a family owned cleaner for 71 years, and our family has personally owned it since 1975. We have a personal tailor at our shop who does amazing work for our customers that keeps them coming back. The quality of cleaning we provide for our clients is second to none, and the procedures we use and standards we keep make your experiences smooth and efficient. We offer a full range of dry cleaning and laundry services to give you and your clothes that fresh and clean look! These will make you look as professional, or as handsome as is physically possible, for any occasion. Whether you are looking to get your business suits or dresses cleaned, or need to have your tuxedo or gown cleaned and fitted before your wedding, we can help with a reasonable cost and timely result. We know you want to feel good and have your clothes well taken care. At Earl's Cleaners we take our job seriously! Some dry cleaners will just clean your clothes and bag them, while at Earl’s Cleaners, we take our tailoring and alterations very seriously, as well as our pressing and cleaning. Nice clothes are expensive and difficult to replace. If you take your suits and clothes to us, you will never have to worry about that fear. 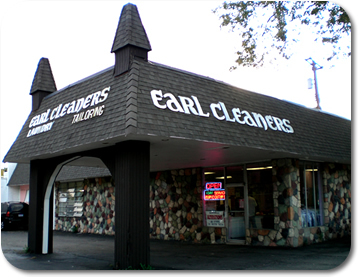 When you are looking for a good dry cleaner stop by and meet the family at Earl's Cleaners - you'll see why we've been around since 1942!